Dale Earnhardt Jr. outdueled Jeff Gordon in the NAPA 200 at Michigan Speedway. This ... this was what race fans had been waiting to see. Dale Earnhardt Jr. and Jeff Gordon went one on one during the NAPA 200 at Michigan Speedway, battling each other for the lead for nearly the entire afternoon. For those keeping track at home, the score's now Earnhardt 1, Gordon 0. Earnhardt took the lead for good on lap 59, passing Gordon off Turn 4 just after a cycle of green-flag stops. He led the rest of the way to collect the 12th win of his NASCAR Busch Series Grand National Division career, and fifth this season. "My car was real loose out front. When I got behind people, it tightened up and was very comfortable. So I was able to hang with him for a while. I saw his car start to loosen up a little bit, so we started swapping the lead back and forth. He'd lead for a while. I'd get comfortable running behind him. Then he'd get too loose and get behind me." To race with -- and more importantly, beat -- Gordon was quite the thrill for the 24-year-old Earnhardt. If the kind of racing Earnhardt and Gordon did today is what's in store for the future, the sport's in good shape indeed. "It's a great amount of fun," Earnhardt said of his duel with the three-time NASCAR Winston Cup Series champion. "He's one of the best drivers out there. He does such a great job. Any time you can race with somebody like that and stay with 'em, it gives you a good feeling, builds your confidence. "We were able to race with him and beat him. We're pretty happy with that. It's something you don't see very often, something I didn't I'd be able to do too often this early." For Gordon, the NAPA 200 wasn't a matter of previewing the future of racing or veteran versus upstart or anything else. It was simply a matter of getting beat. "Dale Jr. just beat us," Gordon said. "That's all there is to it. We were a little bit loose there early in the run. We tried to swap positions with him. We'd tighten it up and I just didn't have anything for him there at the end. "It got a tiny bit tight there at the end. I was still pretty good. They made some adjustments and he was pretty loose early in the race and he got a lot better. They were just better than us." His take on Earnhardt, the racer? "He's very smooth and smart and that's what it takes to win races at this level and the Winston Cup level," Gordon said. "He's got great equipment and he's taking advantage of it. If he does all those same things on the Winston Cup side, you're going to see a lot of success out of him there, also." Not only did Earnhardt beat the very best in the business, with Matt Kenseth's ailing engine dropping him to a 22nd-place finish, Earnhardt got a good-sized boost in the series standings. 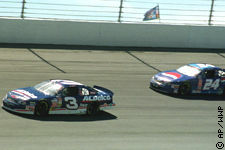 Earnhardt, the division's 1998 champion, went from just one point to 89 ahead of Kenseth. "I'm just glad to be able to build a cushion," Earnhardt said. "I was afraid that Matt was gonna get back in front of us, but we did well and he had some misfortunes. It's a see-saw battle, so I can't say that I'm gonna be able carry momentum. You never know what can happen next week. It's not over." Dave Blaney and Ward Burton drove Bill Davis-owned Pontiacs to third and fourth place, respectively. Mark Martin finished fifth, while Michael Waltrip, Jeff Burton, Jimmy Spencer, Kevin Lepage and Jeff Purvis rounded out the top-10. All but Blaney and Purvis had qualified for Sunday's Pepsi 400. It took Earnhardt 1 hour, 15 minutes and 29 seconds to complete the race at an average speed of 158.975 mph. There was only one caution -- for Gary Bradberry's frontstretch crash on the third lap -- for four circuits. There were nine lead changes among four drivers.